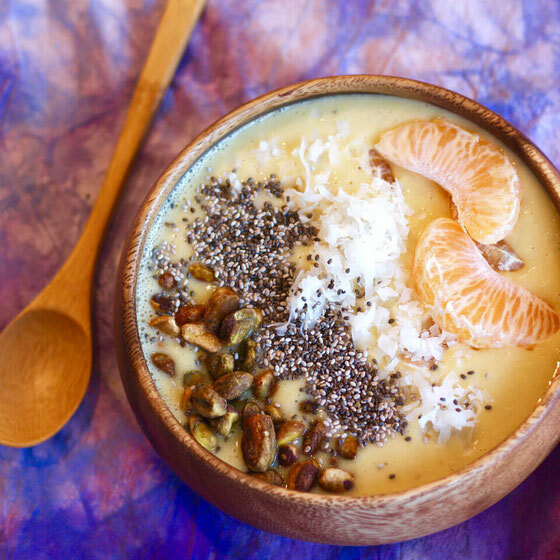 Hello, mandarin orange smoothie bowl! This breakfast treat blends together creamy coconut milk and coconut yogurt with mandarin oranges and bananas. Yum. I've been obsessed with smoothies lately, and recently I was set on the idea of creating a smoothie bowl reminiscent of an orange Creamsicle. I had some coconut milk and coconut yogurt in my fridge, and I thought the creaminess of these ingredients would blend nicely with some in-season mandarin oranges. The yogurt perfectly balances out the citric acid in the orange, and I added vanilla extract to sweeten the deal without adding any sugar. And of course, smoothie bowls have toppings! So I added some of my faves: pistachios and chia seeds for protein and fiber, as well as shredded coconut and mandarin orange wedges because they're delicious. 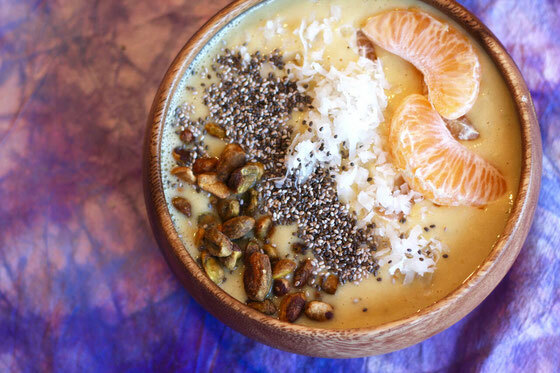 Now, while this smoothie bowl is delicious, it also has nutritional benefits to highlight. (What kind of a blog post would this be without those?) The mandarin oranges provide vitamin C, while the pistachios and chia seeds offer protein and fiber. 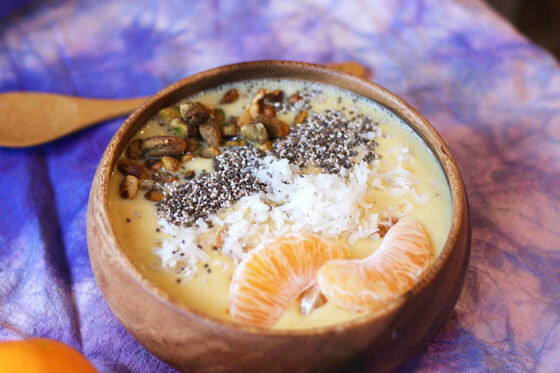 In fact, this smoothie bowl provides 14 grams of fiber, or 56 percent of your daily need! *Note: I used Wonderful Halos mandarin oranges. Blend coconut milk, yogurt, vanilla, banana, 1 orange, and ice as desired. Pour into bowl, and top with remaining orange wedges, pistachios, coconut, and chia seeds. Serves 1. What are your thoughts on this topic? What are your favorite smoothie bowl combinations?